One of Washington D.C.’s ‘funny’ nights took place Saturday during the annual White House Correspondents’ Association dinner. 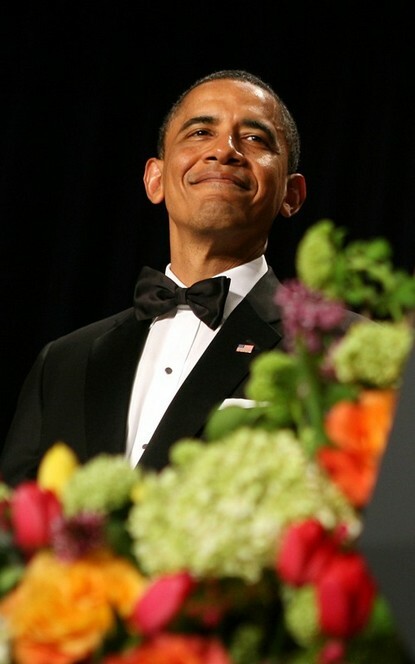 With ‘SNL’ star Seth Meyers hosting, Obama stole the show. In a clear response to recent public questioning about his birth certificate, the President took the mic to aim some comedy squarely at one of the dinner guests in the room, Mr Donald Trump. The president suggested that Trump go on other wild goose chases, investigating famous conspiracies, equating those who doubt his birthplace to those who research Roswell aliens and gripping national mysteries like ‘Where are Biggie and Tupac?’ – thereby marginalizing those who question his birthplace. The crowd laughed when the president then explained, with a straight face, the desperately difficult and weighty decisions that Trump had to make during a steak-themed ‘Celebrity Apprentice’ episode, and how such issues kept Obama up at night. His message was clear: The notion that hosting ‘Apprentice’ is somehow comparable to running the country is pretty hilarious. President Obama’s comedy performance sent another message as well – he takes Donald Trump seriously. Celebs mingled at the black-tie event and related parties. Some of those spotted on Saturday included Sarah and Bristol Palin, Anna Paquin and Steve Moyer, Paula Abdul, Salma Hayek, Mila Kunis, America Ferrera, David Arquette, Bill O’Reilly, Don Cheadle, Cee Lo Green, Bradley Cooper, Scarlett Johansson, Sean Penn, Rosario Dawson, Buzz Aldrin, Rashida Jones, Chris Matthews, John Legend, and Wolf Blitzer.